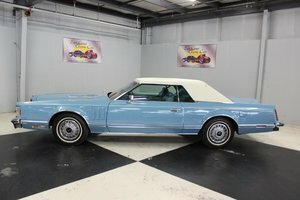 1977 Lincoln Mark V Unbelievable Clean Original Interior! This Lincoln is rocking mustard yellow velour automatic seats. Has a white vinyl top matching overall driver quality paint. There are rock chips on the front near the lights but does not affect the overall look. This Mark V is a rare find. Rides like a dream, floating down the road. The motor appears original as well as most components and no know issues. The only area of concern regarding the interior is the drivers side visor is missing the small plastic light covers for the mirror. This classic is a perfect cruiser for any Lincoln fan. Please Note The Following **Vehicle Location is at our clients home and Not In Cadillac, Michigan. **We do have a showroom with about 25 cars that is by appointment only **Please Call First and talk to one of our reps at 231-468-2809 EXT 1 ** FREE Consignment Visit Our Site Today Easy To List Your Vehicle and Get it Sold in Record Time.